Lydia Kilkenny is eager to move beyond her South Boston childhood, and when she marries Henry Wickett, a shy Boston Brahmin who plans to become a doctor, her future seems assured. 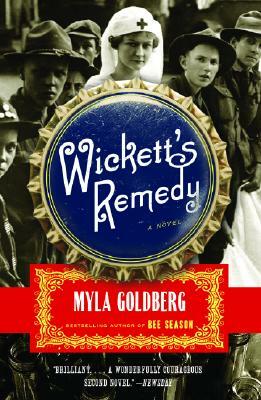 That path changes when Henry abandons his medical studies and enlists Lydia to help him invent a mail-order medicine called Wickett’s Remedy. Then the 1918 influenza epidemic sweeps through Boston, and in a world turned upside down Lydia must forge her own path through the tragedy unfolding around her. As she secures work as a nurse at a curious island medical station conducting human research into the disease, Henry’s former business partner steals the formula for Wickett’s Remedy to create for himself a new future, trying—and almost succeeding—to erase the past he is leaving behind. Alive with narrative ingenuity, and tinged with humor as well as sorrow, this inspired recreation of a forgotten era powerfully reminds us how much individual voices matter—in history and in life. Myla Goldberg is the author of the bestselling Bee Season, which was named a New York Times Notable Book in 2000 and made into a film, and, most recently, of Time’s Magpie, a book of essays about Prague. Her short stories have appeared in Harper’s, McSweeney’s, and failbetter. She lives in Brooklyn, New York.